Here is John Piper’s foreword for Schreiner’s volume, followed by some endorsements. Knowing from James 2:26 that there is such a thing as dead faith; and from James 2:19 that there is such a thing as demonic faith; and from 1 Corinthians 15:2 that it is possible to believe in vain; and from Luke8:13 that one can “believe for a while, and in time of testing fall away;” and knowing that it is through faith that we are born again (1 John 5:1) and have eternal life (John 3:16, 36), therefore, surely we must conclude that the nature of faith, and its relationship to salvation, is of infinite importance. I use the word infinite carefully. I mean that, if we don’t have such faith, the consequences have infinite significance. Eternal life is an infinite thing. And thus the loss of it is an infinite thing. Therefore, any human concern that has only to do with this world, no matter how global, no matter how painful, no matter how enduring—if it has only to do with this world—compares to the importance of saving faith as a thimble to the ocean. The stunning Christian answer is: sola fide—faith alone. But be sure you hear this carefully and precisely: He says right with God by faith alone, not attain heaven by faith alone. There are other conditions for attaining heaven, but no others for entering a right relationship to God. In fact, one must already be in a right relationship with God by faith alone in order to meet the other conditions. “We are justified by faith alone, but not by faith that is alone.” Faith that is alone is not faith in union with Christ. Union with Christ makes his perfection and power ours through faith. And in union with Christ, faith is living and active with Christ’s power. Such faith always “works by love” and produces the “obedience of faith.” And that obedience— imperfect as it is till the day we die—is not the “basis of justification, but . . . a necessary evidence and fruit of justification.” In this sense, love and obedience—inherent righteousness—is “required of believers, but not for justification”—that is, required for heaven, not for entering a right-standing with God. Everything in this book is measured by the Scriptures. “We should hold to the tradition of sola fide because it accords with the Word of God.” Therefore, thematically and structurally, the center of the book is biblical exegesis. “In this book I attempt to tour the historical teaching of the church, explain the scriptural teaching on justification, and provide some sense of contemporary relevance” (emphasis added). But even in the historical and contemporary sections, Scripture remains the lodestar, guiding the ship of Schreiner‘s analysis. Thus the book is overwhelmingly constructive rather than merely polemical—and always careful, for when handling the most volatile issues, one must handle with care. Schreiner is unusually careful in handling viewpoints that are different from his own. I have never read another author who states his challenger’s viewpoint so fully and persuasively, that it seems so compelling, and then turns around and demolishes it one piece at a time with careful biblical observation and argumentation. It is a trait that awakens trust. And this faith is no mere mental assent, but a heartfelt embrace of Jesus Christ as its all-satisfying treasure. “Justification is by faith alone, for faith finds its joy in Christ alone, seeing him as the pearl of great price, the one who is more desirable than anything or anyone else” (emphasis added). “A timely project, and not simply because the 500th anniversary of the Reformation will soon be upon us. Much of ‘who we are’ is determined by ‘where we have come from’; at a time when even so significant a part of our past as the Reformation is, for many, little more than a name, informed, accessible treatments of its basic principles are welcome indeed. Thomas Schreiner. 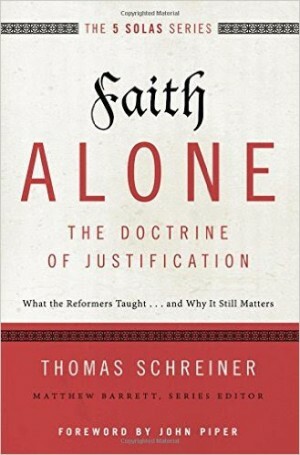 Faith Alone: The Doctrine of Justification. Grand Rapids, MI: Zondervan, 2015. 288 pp. $19.99. Posted with permission.